A New Time and a New Way to Walk It Out! As God leads us on the path of the purpose and call that He has ordained for our lives, the foundation or passion does not change but throughout that path the scenery, at times, does. As I’ve walked with God I’ve learned to keep on walking and trusting Him during those times of change and to push aside those thoughts of wanting to understand all the plan right then. During these days, the Spirit of God is at work with many ministries and individuals tweeking, realigning, reassigning and leading us into new ways that we haven’t walked out previously. I also have been walking through a transition. I have changed some of my steps during the past several months. Although things felt a little strange at first I chose to follow the Spirit of God and walk it through. During the past 2 weeks while here in Honduras I have experienced some of the fruit and the wisdom of these newly ordered steps. I am one who does not like being “put in a box.” When out shopping with my daughters and one of them says that a particular item doesn’t look like me, I immediately look inward to convince myself to buy it. I don’t ever want to be in a rut or to go over the same steps day in and day out. If I perceive from another that they cannot envision me doing something because of what they have seen me do in the past, something in me rises that wants to prove them wrong. Realizing this in myself, I am disciplined to talk to God about my steps when those feelings overtake me to keep my walk and desires in keeping with His will. Last year the Lord began talking to me about not maintaining a house in Honduras but to travel back and forth. The detail came out bit by bit. God spoke to me about writing Christian curriculum in Spanish and also about working on a book that He had put in my heart many years ago. The book is to be about raising a child with disabilities in faith and under the authority of the Word. So, in October I did close my house in La Ceiba and began to look at different ways to carry out our work in Honduras in the new steps that God was giving me. Suddenly technology options appeared that allowed me to support and provide for the teachers and schools that God has connected me with. During those times that I am in the States I can easily access tools and resources and then immediately communicate to those in Honduras and also send documents and materials in digital form by internet. To be honest, it has been a challenge of time management and organization to combine this with daily demands while in the States. But again and again, the Lord is showing me His new plan. I must admit that I believe I had my idea of how to do missions in a box. As this year has unfolded I am thankful that I did not stay in that old box. During the past two weeks I have been able to provide 4 schools with new curriculum packets, training and supplies that I wrote and compiled while in the States. 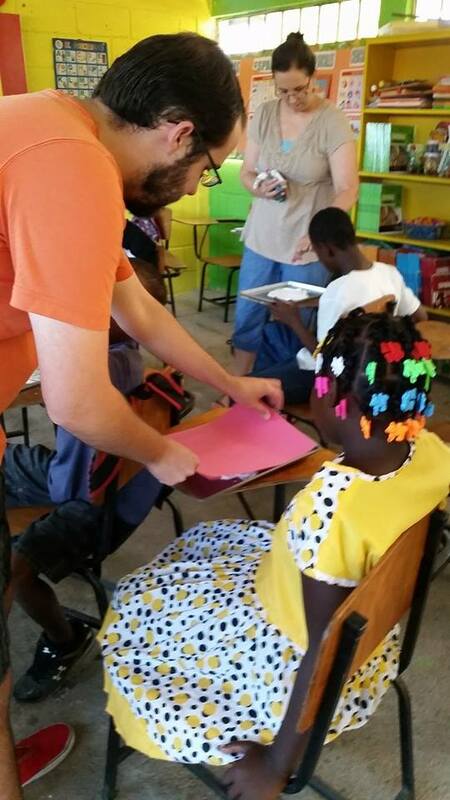 I was also able to give activities to teach the children about God, His love for them and all He has given them. 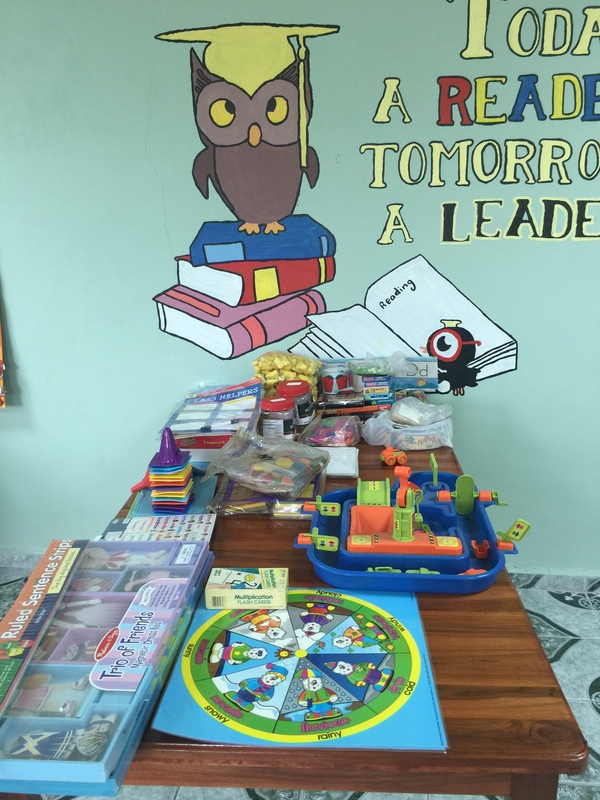 I now see that with my day to day work in the schools over the past years have given me an entrance and a wide open door to the schools in this area of Honduras. It has also gave me very intimate working relationships with the teachers both in the city, villages by the sea and in the mountains. I did not totally understand all during my steps of the past 6-8 months, but I did know that I was responding to the leading of His Spirit. At this moment, I feel the awe of seeing another aspect of God’s plan made plain. The vision and the passion is the same. The scenery has changed a bit with the steps. As long as the presence of God is there, the scenery is always full of His glory. 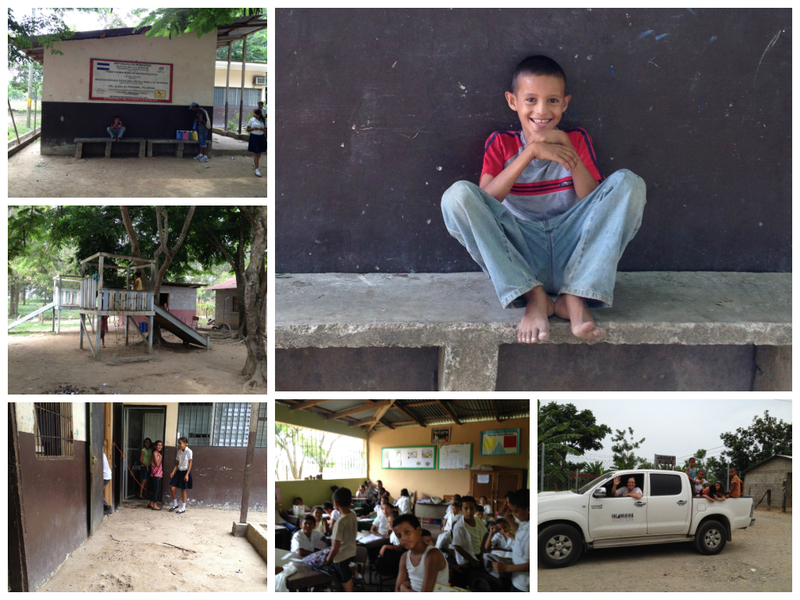 Below are some pictures from our recent time in ministry in Honduras. Rejoice with us in His goodness! I love it when the three of us get together. We plan and put together great things! Letter stamps, paper and an ink pad gave these children such joy in learning! Another precious time with the special school in Corazal! 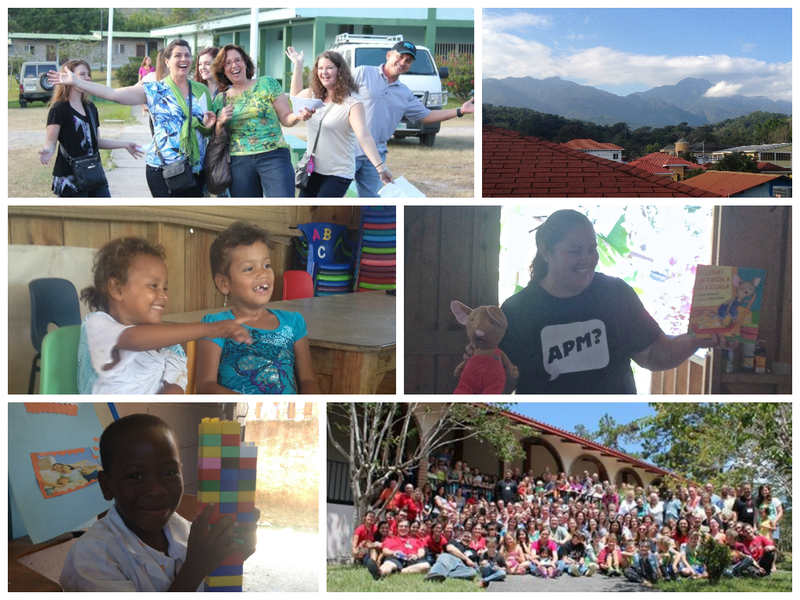 God placed the desire in my heart before 2001 to provide a library in a Honduran village. Just look He did it and He used us!!! I’m so excited and amazed to see it. God really does more than we can ask or think! I love working with Iris. She has a great vision for her school, loves the children and is giving her life for them. 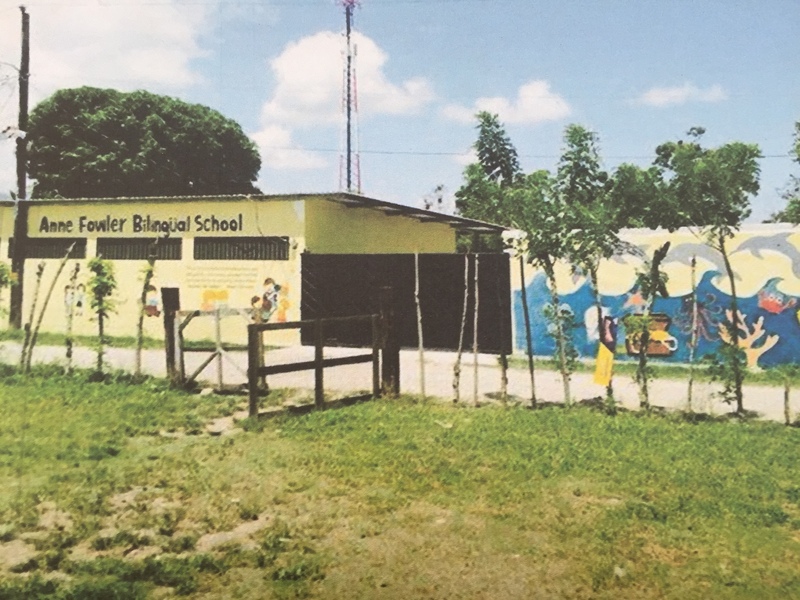 The Anne Fowler Bilingual School, in the village of La Union, about 40 minutes outside of La Ceiba. It is growing, alive with lots of learning and fun! Several years ago, in 2001, I was in my first year in Honduras and in Tegucigalpa. I was visiting at the house of a missionary friend and while I was there saw some pictures of the north coast area of Honduras that I later came to know as La Ceiba. As I looked at those pictures I felt the presence of God come over me very strongly. I left my friend’s house and drove around for a bit asking God why I was feeling this so strongly and what I was to do. All He said to me was that I was to collect and save things for a school. I had already begun to do that and it was confirmation of what was already in my heart. During the years since, I have collected wonderful things, boxes and boxes of curriculum, learning aides and books upon books, things for Science, Math, English, Spanish, Geography, etc. including Bible Curriculum. I have used these things again and again in schools I have taught in, where I was principal and those I’ve helped but I had never found the school where they were to be. I knew that there was a purposed place for them. I moved many times during all my 14 years in Honduras and each time all the very heavy boxes of books, and learning aides would be moved also. At times, I felt frustrated and wondered if I missed God and that is seemed silly to keep caring for all of those things. It required a lot of work and storage space to keep them from ruin in the humid, damp climate of Central America. Then in the past year I came to know Iris Carranza and her school, the Anne Fowler Bilingual School. Actually this came through my friendship with Anne Fowler. I donated some things to the school and then God placed it in my heart to donate many English books, readers and some curriculum and learning aides. 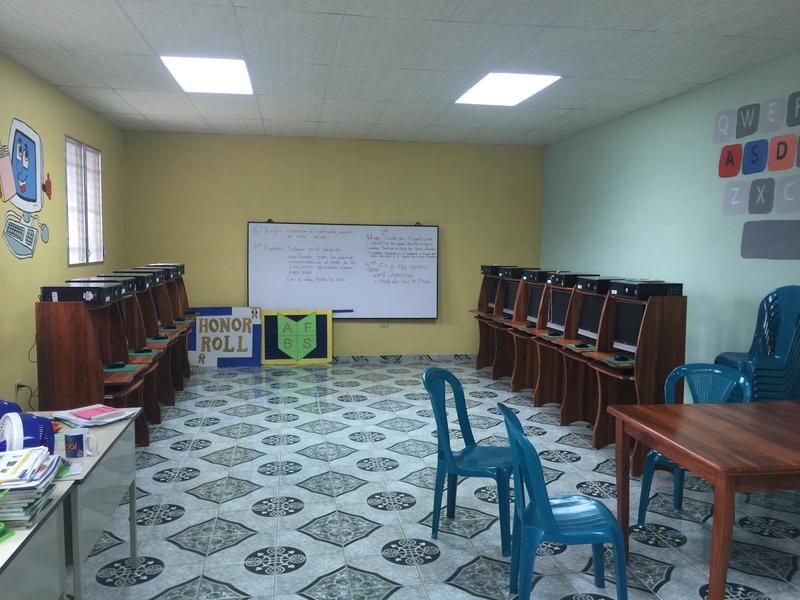 Last month I visited the school to see the library which we had made possible for the school. As I walked in I was amazed at how wonderful everything looked. 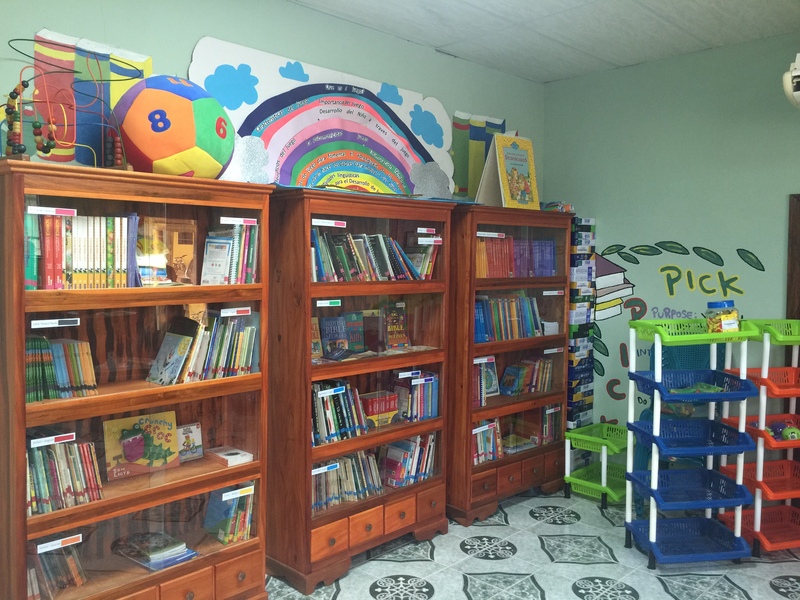 For years I had the dream of making a wonderful library for a Honduran village and now I was looking at it. God spoke to me then and told me that it was for this school that I had been saving those things and moving them from one place to another for years. I cannot express how much joy this has given me. The vision that I had carried around for years came to reality before my eyes. I didn’t miss it and I have been so grateful that God gave me the grace to continue in what, many times, seemed to be a crazy waste of time. It wasn’t. So, now more than 2 more truck loads of books, curriculum and supplies have been donated to this school. 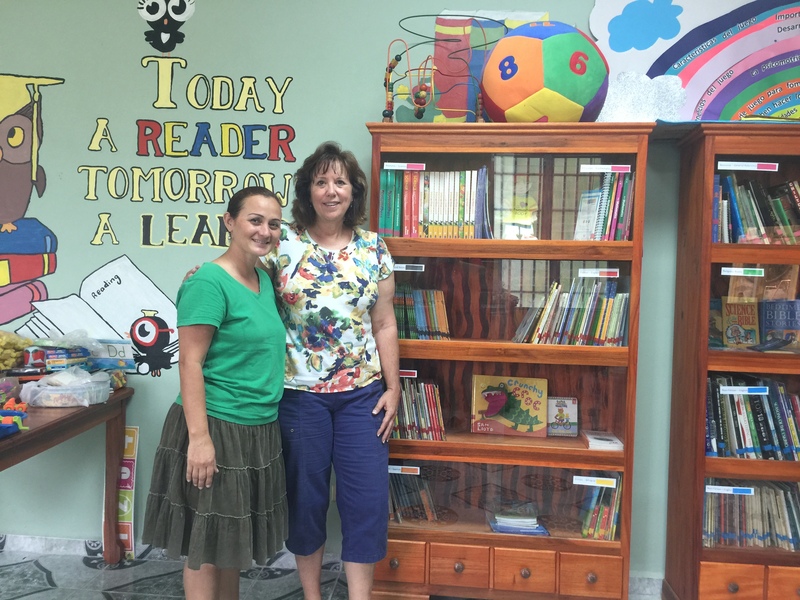 Iris Carranza the Directora of the Anne Fowler Bilingual School and I in the new library. It is beautiful! God is so good! After years of saving books and learning supplies as God told me, they finally arrived at their intended home…..and it all looks so pretty! Today a Reader…..Tomorrow a Leader! A lot of leaders are going to come out of this school! Another donor came forth and supplied new computers and desks and the new computer room. God is blessing this school! The library is at the other end of the room. More donations for the Anne Fowler Bilingual School. I’m looking forward to returning to see it there! It must be Fall……..It is raining……ALOT! I’m so thankful for the diversity of the body of Christ and it blesses me so to be a part and experience how God has placed us together with our specific gifts to accomplish His purpose, to bring His love and kingdom on this earth. The past few months have been a blur of working with students on a new reading program, traveling to conferences in the USA, Nicaragua and Texas…..Isn’t Texas another country?!?…. and, of course, Honduras. We receive from each other when we gather, from fellowship, the Word shared, and encouragement that reignites each other’s visions. Paul’s words were very on point when he commanded the believer not to miss the assembling of the saints. 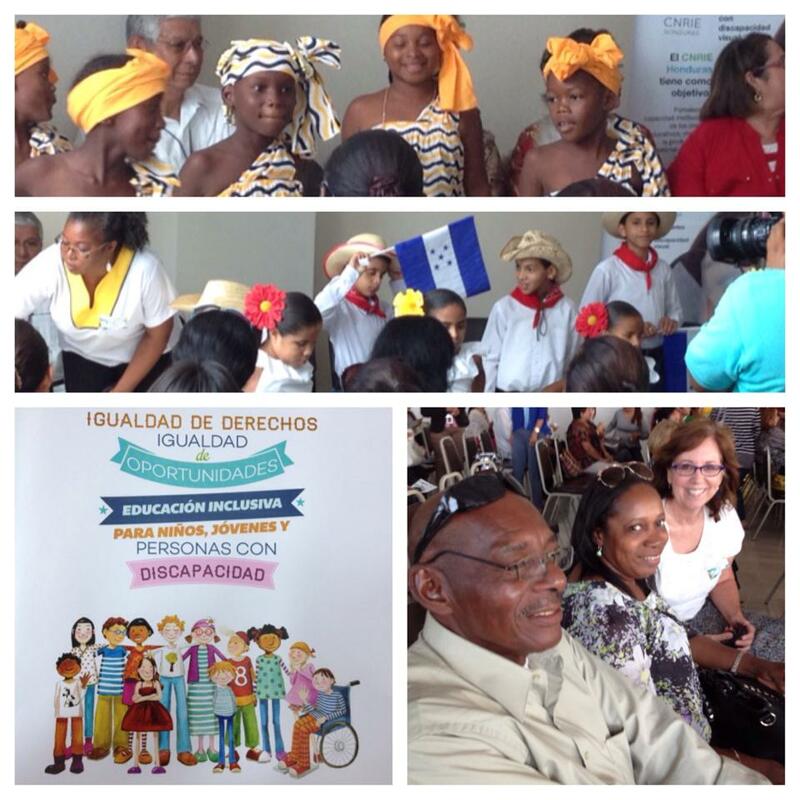 A full day at day one of the First Special Education Conference held in La Ceiba. Lots of information, presentations by the children and time with other professionals. 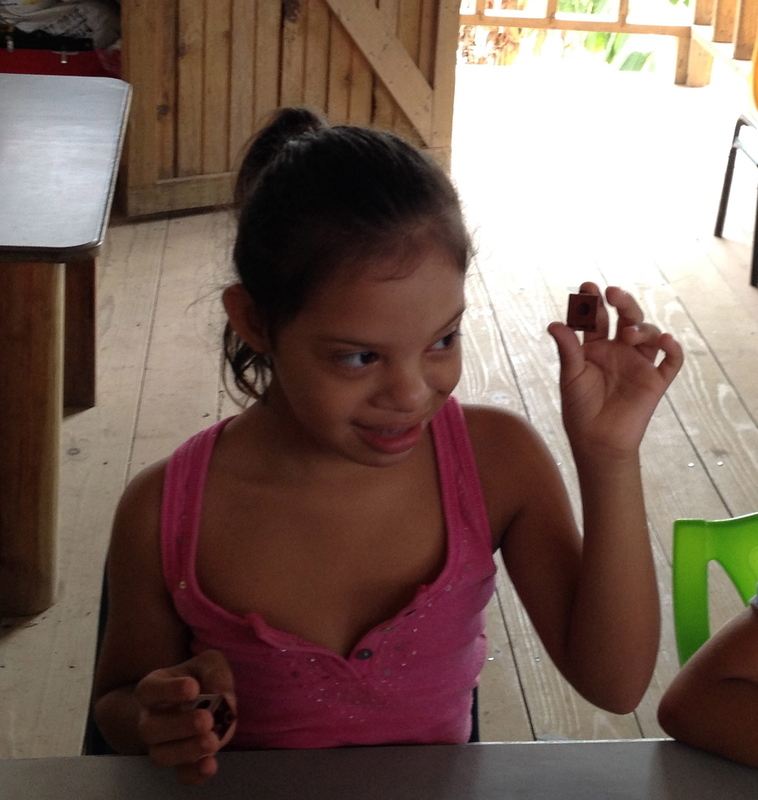 Honduras is moving towards helping those with special needs. Blessed to be a part! A couple of weeks ago I was encouraged as I attended the first conference on Special Education by the Honduran agencies. Presenting were speakers from different areas of Latin America and the national director of Special Education for the nation of Honduras. Inclusion was the main topic as the Ministry of Education has decided to improve this area of education. Inclusion currently does not exist here. Currently, a very small portion of those with special needs receive any education and even then the quality is very lacking. But Honduras is stepping out in making this a focus. 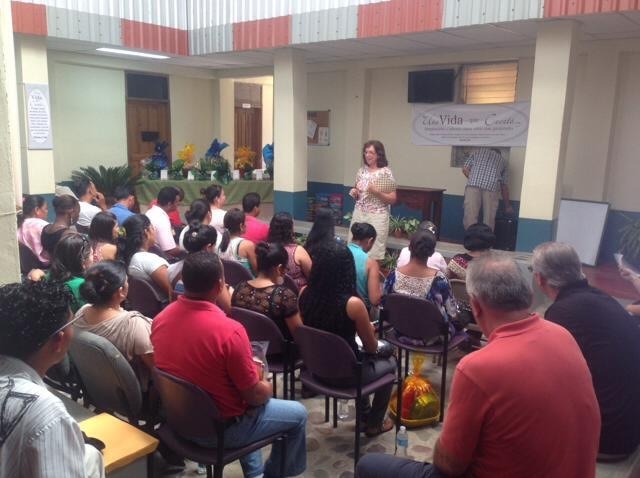 Speaking to the teachers of The Cuenca, the area of mountain villages near La Ceiba. I was a speaker at a conference in the mountain villages where over 100 primary teachers attended. We participated with two other ministries and we were well received by the teachers. We shared techniques for education and effectively working with children and also shared the Word of God. What a blessing to be in a nation where that door is open! I’m taking advantage of it! I so appreciate having relationships with other ministries and working together with them, all contributing their God given focus to flow together. The way it is supposed to work. Melvin, proud to receive a well-earned certificate. He completed the first part of the new reading program in record time. He could not read before…..He can now!! The most exciting progress that I have had in my work with children is through a reading program that I am translating into Spanish. For 15 years I have thought I would love to have this particular program in Spanish. Well, the time came, through working with a young girl who has autism. It is huge project but I currently have almost half of the first year translated and will have more time to work on this over the upcoming break. I began using it at a village special school and it has been so exciting and rewarding. Several students who are in their teens and have never read are learning. Their excitement in learning is wonderful and the other students are wanting to work more. It is an exciting time. My goal is to write words into the program so the children can quickly begin to read simple scriptures from the Bible. Working with God is so much fun! 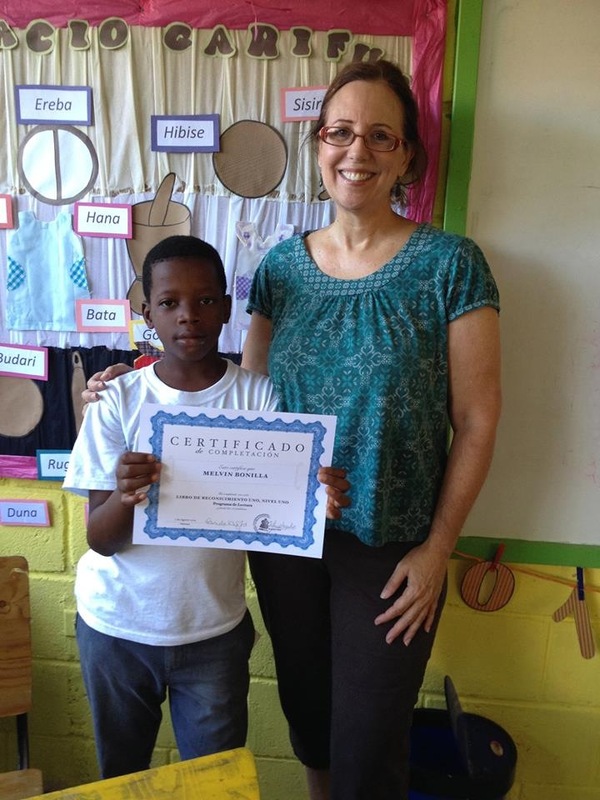 Pictured aboveis Melvin who received a certificate for completing the first quarter of the first year. He is now about to complete the second quarter. I am so proud of him. We are working with him so they he can attend normal school in the future. I will leave you with a photo I like of the coast of La Ceiba which I took from the new dock that was built after a storm destroyed the former one last January. The old one had holes all over it and after walking on it several years, I vowed it would be the last time. The new one is beautiful and also is the view to look back at the city. Be blessed! Thank you for contributing your supply in this work. Your part is very important. Thank you for saying yes to God in your giving and prayer. 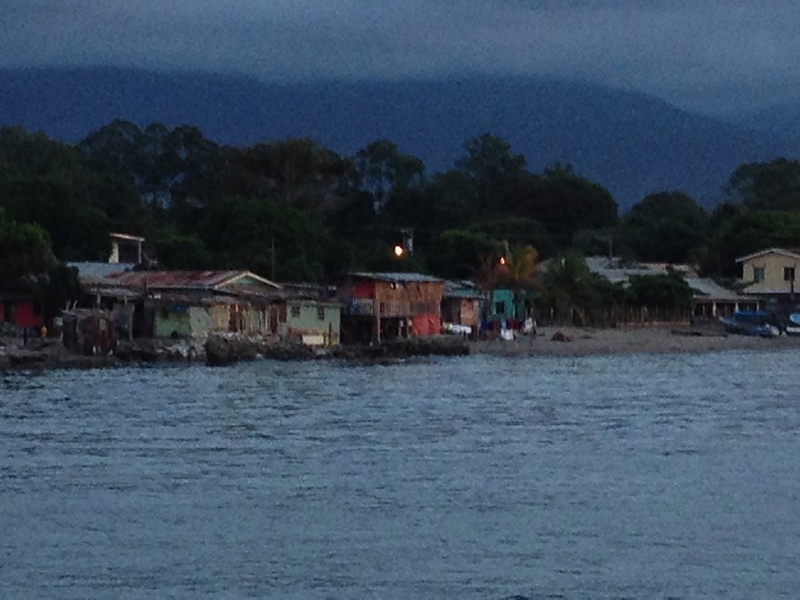 A recent photo taken from the new pier in La Ceiba at the end of the day. Beautiful, isn’t it! Oh my! It is July! But that means we are not in dry season anymore. When you live in other parts of the world, you realize how important water is. It is important in the States but the vast majority there never goes without. Sorry, I am not counting when it may get turned off for a few hours. When we lived in Tegucigalpa, my children and I lived through 2 1/2 months with no water in our house except for maybe 8 days. Although that was many years ago, that experience left a mark on me. To this day, I love to immerse my hands in water. Just as it is with the Word of God. I need that constant immersion in God’s Word and His presence. So grateful that I serve a God who deeply desires a relationship with me. He likes me and more than our works and good deeds, His Spirit is compelling us into His presence and love. Lately I have been enjoying hosting for several weeks. First, my daughter Jill and her boyfriend Jon arrived in late June. We had a very full week of visiting schools, traveling up the mountain to the medical clinic and to attend a village church and also enjoyed a couple of days on the island of Roatan. 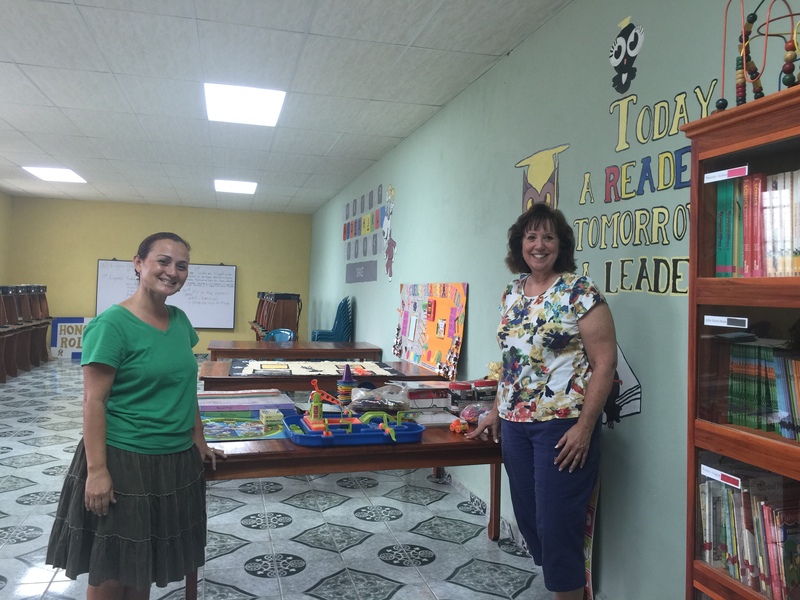 Jill’s heart has always been in Honduras and she and Jon had a fun art project that taught colors for the students in Corazal. Jon developed a tender place in his heart for this country before he left. 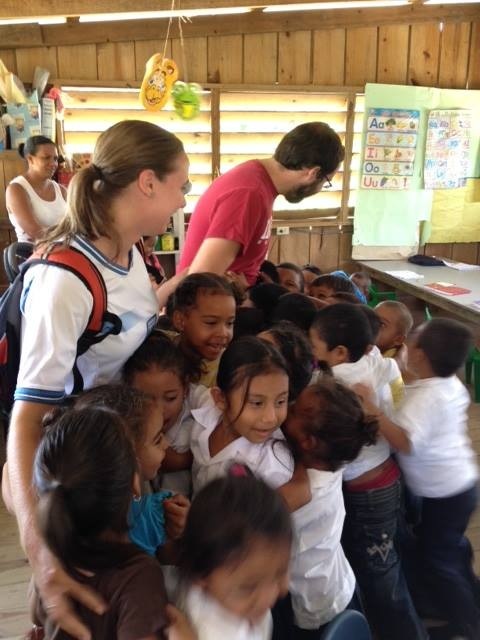 Perhaps it was the beauty of the mountains, the turquoise waters of Roatan, the wonderful Honduran food, but probably just as much the warm hugs and welcome that the children in the Porvenir school gave in the picture above. It was a wonderful week, that went all too fast. There is always next year. Already looking forward to it. Then I hosted Gloria Sloan and her son, Alan. Gloria is a dear missionary friend whose base is in Tegucigalpa. She was our speaker for Iglesia de las Naciones’s missions conference that began this past weekend and will continue all month with special programs for the youth, children, women and pastors and leaders. This week, Nicole, has been with me. She is from a missionary family here in Honduras. 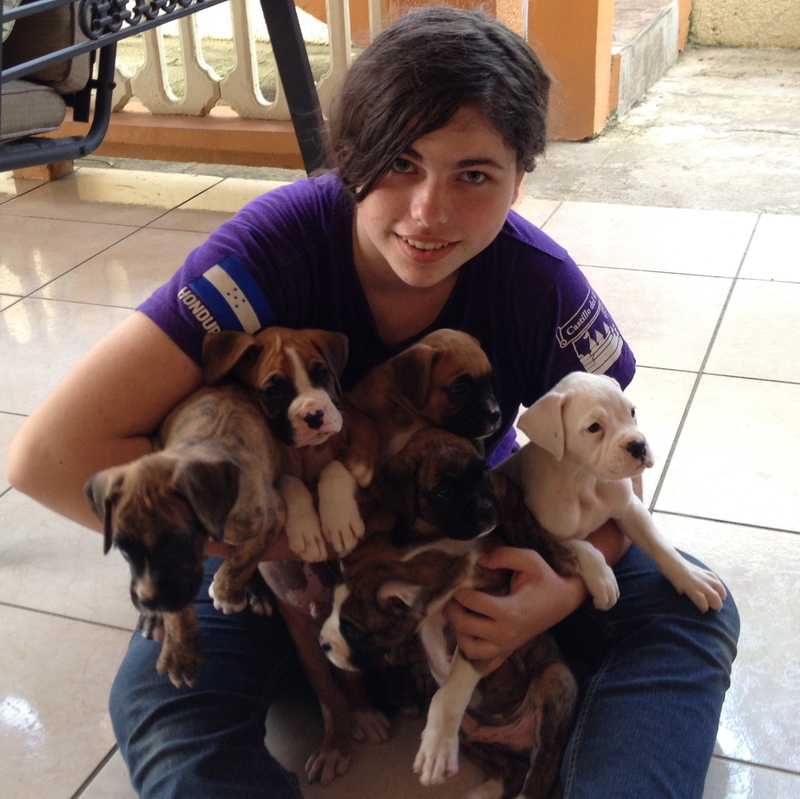 We have sorted teacher supplies for donating, ran around the city on all sorts of missions and, of course, loved on some puppies. I can’t end this post without talking about the puppies. Paul was a sent one also and he made tents to enable him to fund his work. Well, I don’t know how to make tents so we made puppies. Dottie, my boxer, should get Mother of the Year award. She has been great although at this point (the puppies are 6 weeks old today) I think she is thinking of them taking on their own responsibilities. So, it is now time for someone to buy them. I do have one dilemma though. One of them was born albino….all white with dark blue eyes and a cute black nose. I may not be able to part with her. Dottie needs company, don’t you think? 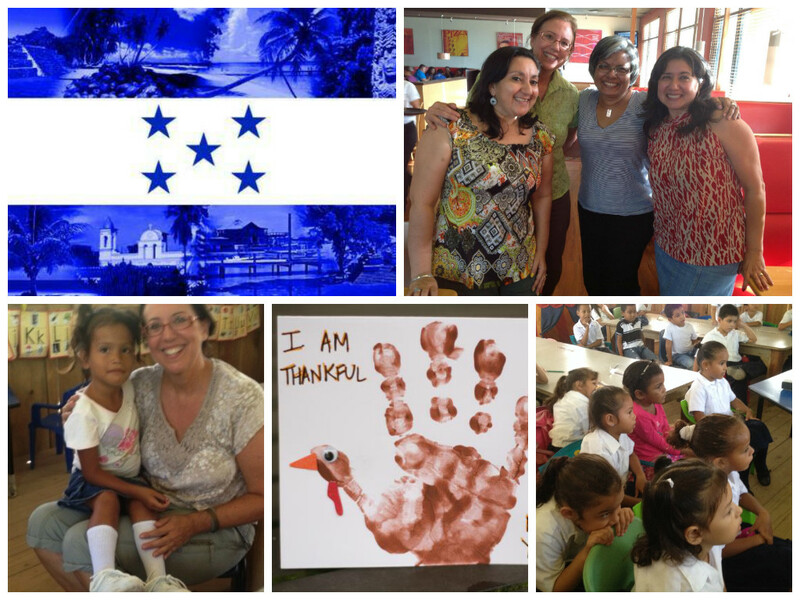 Lastly, I would like to list a few items to agree with us in prayer for our ministry here with the children in Honduras. Thank you so much for your prayers and your interest in God’s work here. I heard a quote recently that moved my spirit. “The gospel is good news only if it gets there in time!” We must be about the Father’s business, following His Spirit and reaching out to others. We can’t delay in what the Father has called us to do. Nicole, my house guest this week with all six puppies. Lots of love, licks and puppy breath. Jesus said “Go” and we are going…………..
Ahh! The quiet afternoons with a tropical rain. So nice. All six puppies are bathed, fed and sleeping. I have been in the midst of sorting and organizing supplies to donate to schools here. I am in the middle of the project so I’m currently looking at various piles of stuff…..wonderful stuff….but stuff. A great time to take a break and write a blog entry, right? If you’ve never experience a tropical rain, all I can say is they are great. So cleansing, like someone has just turned a huge watering can upside down. As the water is falling the palm trees are twisting and turning with the wind. The breezes blow, breezes that you had forgot existed in the hours before in the hot, hot, humid sun. There has not been much rain here this year so water has been rationed and turned off at least every other day and wells were running dry. This rain is very welcome. So refreshing. I wish I could share this with you all here. There is so much I wish I could share, the face of the children, the joy you see in the teachers faces as we help them with learning supplies and ideas, the interest in ideas as they see different methods reaching children who before weren’t learning and just the plain fun or working with kids. 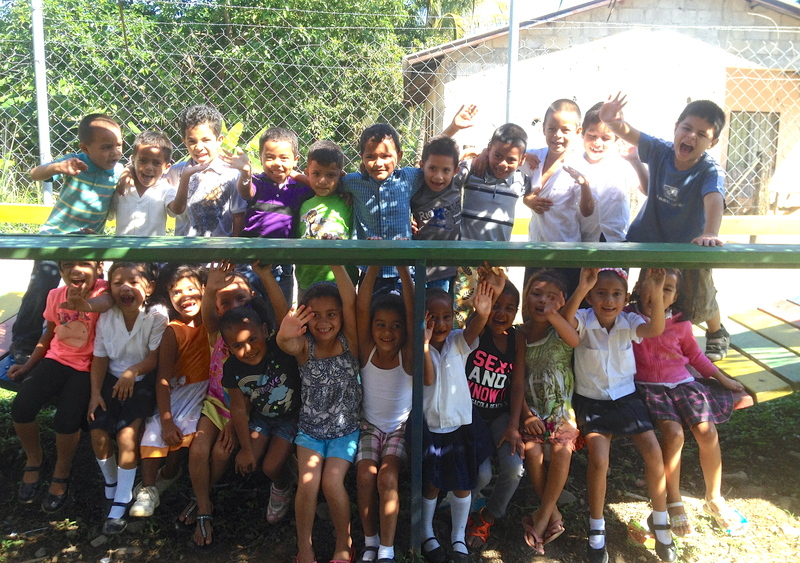 We have a new school that we are helping The name of the school is Semillas de Esperanza (Seeds of Hope). They were excited to hear the name of our ministry. It is a public elementary school of about 200 students and is very poor as you can see in the pictures. 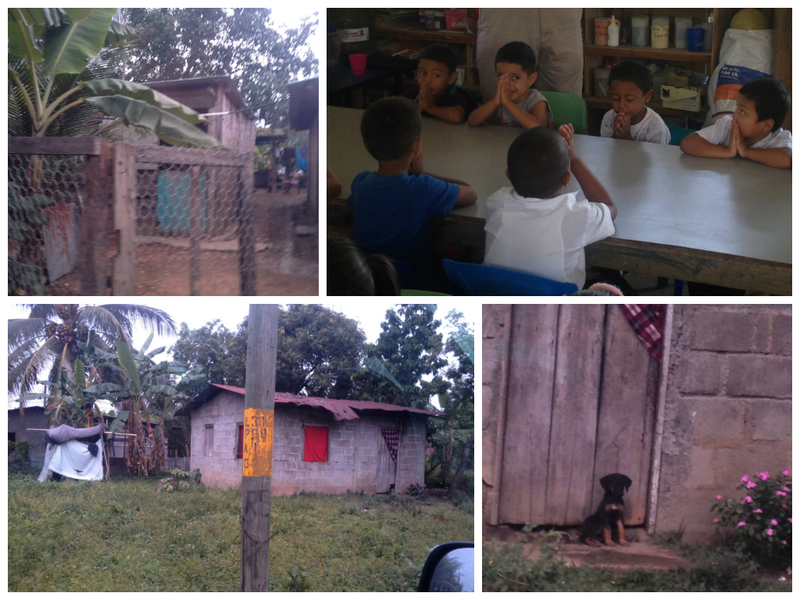 The village neighborhood of the Semillas school has much poverty and many children grow up spending their days in the streets. If their parents have a job they are left alone from early in the morning until night at least 6 days a week. So, many are not enrolled in school. One boy like this is Carlito in the picture. Every time I drive up to the school he runs to greet me and stays by my side constantly seeking my attention and promises that he will come to our group. He is 10 years old and is not enrolled in school. In talking with him, you can see that he is very intelligent but right now does not have the concept to think about tomorrow and the idea of how an education can help his future is something that doesn’t really seem to have anything to do with his current reality. But I’m going to keep on trying. I strive to be led by the Holy Spirit in where I go and who I am helping. I find it interesting that in every school where God has led me are Christian teachers. Teachers who know God’s Word and believe that their job is a ministry. Several times they have said, “We were praying that God would send help to us.” Or there may have been parents praying. Just know that God does hear us and responds to our requests. He is waiting for us to ask. God’s Care and Provision Flows Through Men……Through Us! June is here! That means it is time for the rains. Hallelujah….maybe some relief from the heat! I know those in the States are now ending their school year but here in Honduras we are in the middle of ours. The public school year calendar is February through November so no vacation planning here. I have been in the midst of evaluations, translating lessons into Spanish and making learning activities and materials for the teachers. Before I go on further, I do want to share a bit of great news. In my last blog entry I wrote about a little girl at one of the schools I go to. She had broken her arm and needed surgery to put in pins and plates for her arm to heal. The family is very poor and were unable to pay the amount required to the social hospital. They were without any options and the child, Yenory, came to school with her arm wrapped in scarves and knotted. After that visit, I made a call to a doctor friend here, another missionary, who told me that he had pins and plates that someone had donated and that he could take care of the medical needs. We have been so excited! God is good. He makes a way for every need we have. Below is a picture of Yenory. She has her scarf on her arm but not for long. 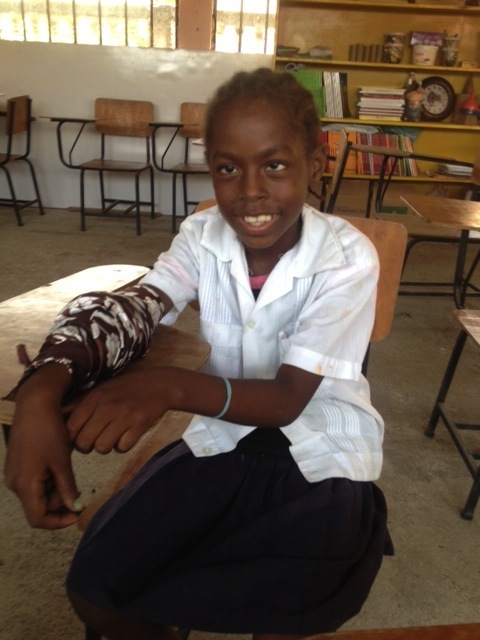 God is making a way for Yenory to get the surgery that she needs for her broken arm to heal. Seems like it is the time for babies. Several babies of friends and church family have arrived this past month. Another addition to the church may be arriving today. 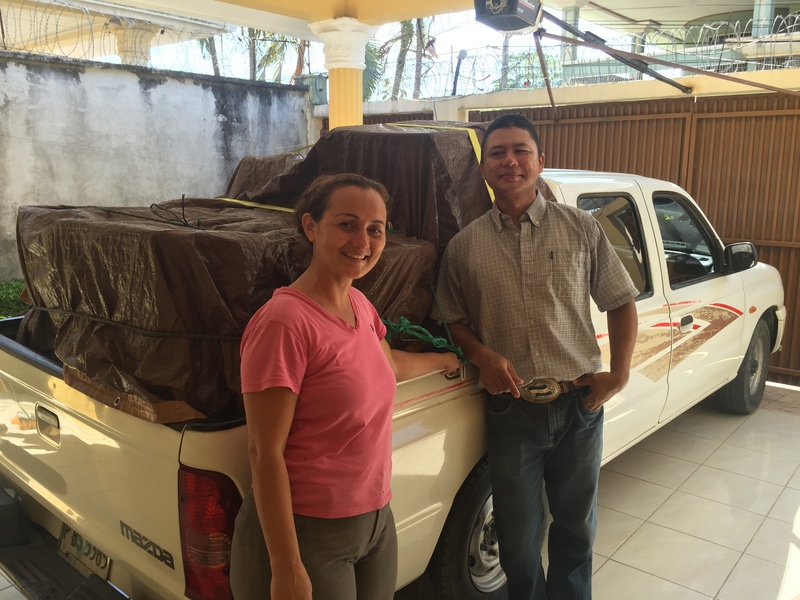 Noe and Laura Sordo who are called as missionaries to Indonesia and are in their time of preparation have been patiently waiting for their first, Adrian to arrive. As I write this I am waiting to hear the news. Laura and Noe will need to learn English and I will be helping with that but right now I excited to meet the one who will be the youngest of their future missionary team. To add to the baby arrivals, Dottie, my dog, had her puppies the other night. When the first one came it shocked her and she did not know what to do. I think she was relieved to have “whatever that was” out of her and she just wanted to sit on the pillow. I, on the other hand, was also shocked to have just noticed the puppy, sack and all with attached placenta, sitting on the porch floor. I felt like Prissy on “Gone With the Wind”. Even though I’ve had four myself, they weren’t puppies and I was panicking thinking the thing would die before I could figure out how to get the sack off. He was so slippery and I think he may have fallen a couple of times, not too far, as I tried to pick him up. After what seemed like ages, Dottie followed me to the prepared birthing box as I called it, jumped in and somehow figured out what to do with me helping. The other five came easily and now she is the best dog Mom I have ever seen. She is so proud and so attentive. I was planning on selling all of them to raise money for the ministry. However, one of them is all white and it is tempting to keep her. Right now she looks like a little piglet and I was thinking of the name Charlotte. We will see………. But they are all adorable. 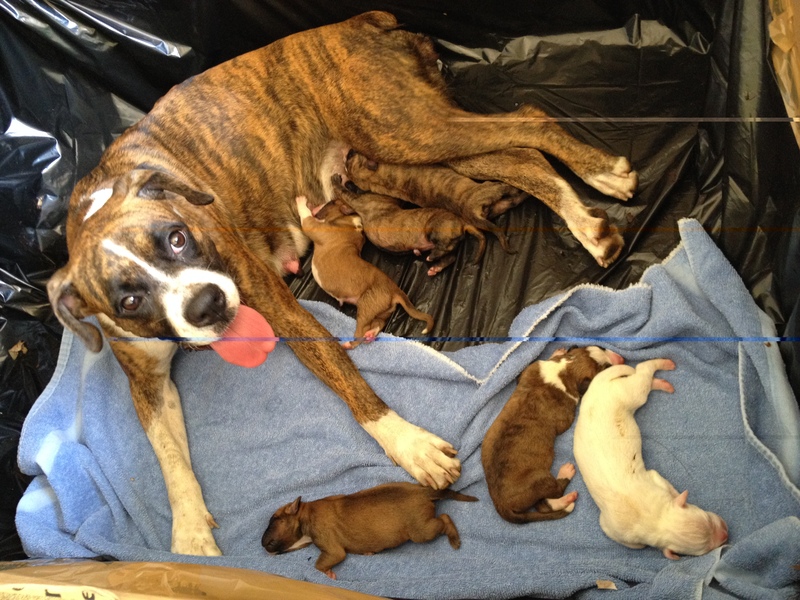 Dottie Super Mom with her new pride and joys! So far it has been easy. When they are mobile with eyes open, it ought to be interesting! Unifix cubes made learning numbers colorful and creative. It is a blessing giving these children this experience to learn but even more to train the teachers with new methods. Nohemi is new to our group. She lives in the village, has Downs Syndrome and is attending another Kinder in the village. She was excited to be in the group and fit right in. We Have All Been Given the Same Treasure! Whether we live in Cesar’s house (upper left) or Maria’s house (bottom left) we all need God and someone to teach us how to have a relationship with Him. It is summer time in La Ceiba. La Ceiba is known all over Honduras for being hot. Well, now we get to experience La Ceiba heat at it’s “best.” So the only place to be in the afternoon is in front of a fan, which I am at the moment. There are many in this world who think their cell phone is their most important possession. Send them down here and I’ll help put their life in perspective! Haha! A fan takes on a whole new value. So, yes the heat is something to deal with but I am having such a rewarding time in the schools that the other is just part of life. It seems that I am in a time where things just seem to flow, a flow of favor, a flow of peace and a flow of joy in the work I’m doing. I have posted many pictures of the precious children here in Honduras and several of you have smiled, commented and enjoyed them. They are precious and adorable and have such pure hearts. But I also wanted to share with you a little bit of the life they come from. The vast majority of the students that I work with are from homes with intense poverty. This is the kind of poverty that you do not see in the States. This is the kind of poverty where some may go for days without food but there is no soup kitchen, food stamps or free school lunch program to help fill that need. In their neighborhoods, they are surrounded by neighbors in the same situation. When there is no work there is no money. There is no unemployment check, no disability check and no medical assistance. Today I was in a village school. There is 9 year old girl there who fell and broke her arm. After a month in a cast the doctors removed the cast and told her that she would need surgery to put in pins and plates for her arm to heal properly. At the social hospital (not a place we would ever want to go) the fee for this surgery is almost $400 and the family does have any money. They do not even have money to buy shoes for her. This is their daily reality. So, she currently has an ace bandage crudely wound around her arm and knotted at the end. If someone has a cement block house, you are considered very fortunate. Usually these will not have paint, just rough cement blocks with a couple of rooms. Pictured below is a cement block house of one of the students. The sheets propped up with sticks to the left is their “bathroom.” The little girl who lives there is precious and is experiencing books for the first time in her life. I love the little puppy sitting on the doorstep. Future guard dog in training! The other house pictured is difficult to see. It is a small 1-2 room house of one our students. I talked about him in the last blog. This is the house he caught on fire when he was left alone for several days. His mother was very sick in the hospital with AIDS. His bed, clothes and their furniture was burned. This child is 7, but very small and developmentally delayed, functioning more like a 4 year old. But he is doing well. His mother is out of hospital but still very sick. We are thankful that there was not more damage from the fire as the house is built from scrap wood, no cement floor, just dirt. Some of the children come to school hungry and sometimes you can see them appear sluggish, laying their heads on the table. They are hungry. We are looking for local churches to help provide nutritional food so all can have a meal everyday but the local churches consist of this same community. This week I was able to give several pounds of meat so they could have a full meal during their snack time at school. If this is something you would like to help with, let us know. But even though while being in these situations, the people live with gratitude. Many are trying to live by faith and are living by faith in a dimension far above even what any of us will ever do. Many times, I hear testimonies of God’s faithfulness and miracles of provision and healing. God is good and so merciful. He is helping all of us grow up in Him into “better.” He desires better for them. But people are people no matter what kind of house we live in. We all love our children and are doing the best we can to help them grow up into the life that God has for them. We all desperately need God, His wisdom, His love and His salvation through Jesus Christ. I am having a blast sharing fun learning experiences and having success at reaching them academically but all the while knowing that the real treasure is life through our Savior Jesus Christ. He is the source of the answers we need, of the guidance that we seek and the love we were created to receive and to give. Dios le bendiga. God bless you. Well, it seems like it has been forever since I’ve posted a blog and it has been a while, so I will try to catch up with this one. However just writing about the month of March could be a book. Do you ever have one of those months where at the beginning it would appear to be no way that you could accomplish what is on your calendar and still be sane? Well, that is how my March started, full of good things, including 3 conferences. During the first week I traveled 6 hours to another part of Honduras for a missionary retreat for ministers all over the country. What a fun time of fellowship and such good Word preached on faith, not to mention great food and a stop by Lake Yojoa for fresh caught fish (the ones served with the heads still on)! Then came the Ladies Conference at my home church in the States. I had been looking forward for this for months and was not about to miss it. It was such a blessing for me to be able to return and be with everyone there for such a rich time in the Word. A couple of days after I returned to Honduras my third conference of the month was scheduled, in which I presented on ministering to those with special needs to various churches represented as far away as Guatemala and El Salvador. But, to make March a little more interesting, during the second week of March it became obvious that I needed to move and to move pretty quickly. There were some issues with the house that I was renting. 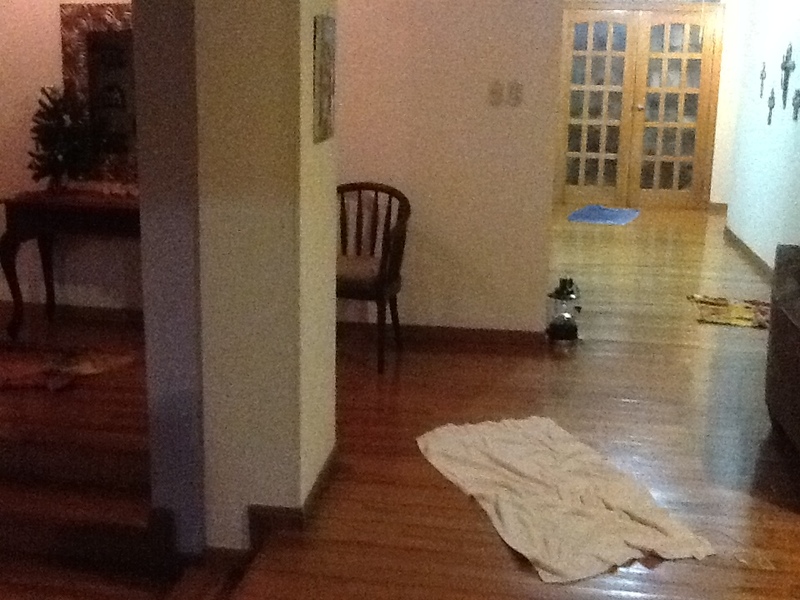 You may have noticed previous pictures showing leaks all over the house, but even more had surfaced. So, although I had planned to have a week in the States before the Ladies Conference, my departure was delayed and God came through as He does so wonderfully. In one day, I had met with the realtor, negotiated a contract signed the contract and had the keys to my new place and in 2 days was all moved in. I will note here that I have a lot of things……especially with all the educational supplies I have….. a LOT of things. But God! He makes a way where there seems to be no way. I am so thankful for wonderful friends to help too. I moved in and made it to the conference just in time. It all happened so quickly that all my attention was focused on the physical needs of space. But when I was actually in the house and saw where the Lord had led me I was so thankful. There is a room over the garage surrounded with windows which is separate from the house. I was thinking that it would be great to use to work with children and it is but I had not noticed the beauty of the mountains and the breezes from the ocean. When I am in that room, I think of the scripture in Psalm 23, “He makes me to lie down in green pastures. He leads me beside the still waters. He restores my soul.” Now that we are in April and the schedule is getting a little bit more back to normal, that room is my green pasture beside the still waters. God is good. I am excited about April. We are beginning a Ladies Bible Study out in the village of Porvenir where I have been working with children. We are in preparation for that. It will be a bi-lingual group of ladies. Please be in prayer with us for this project. There are several churches in this village but there seems to be a real hunger for the Word and that is what I am so excited about sharing, God’s powerful Word. I attend church on Sunday mornings in this village with other missionaries and it has been an English service. But in the past few months more and more Spanish speaking people are coming and we now have bilingual services. God is doing something. At our Saturday group this past weekend I received several good reports on our kids. One is about Milagros, who was in the kinder last year. You may remember I bought her some shoes. She was born with spina bifida and medical needs. There were some learning issues and one of them was in her fine motor and handwriting coordination. She is now in first grade and her kinder teacher and I were concerned with her being able to keep up. She has been in class for a month and her teacher says she is the best worker in the class and has the best penmanship. No learning problems at all. I was speechless as I watched her write on Saturday. Her penmanship was beautiful. God is so good. This could only be God. Also, I had written about Cesar before. His mother has HIV, is very sick and he has a history of malnutrition and disease. When I met him he seemed listless, would not participate in school and I never had heard him speak. I was told he had always been like this. A few weeks ago, while his mother was in the hospital, he had been left to stay in his house alone. Yes, he is a kinder student. About 4:00 in the morning he decided to light a fire and try to copy what he had seen on television. He burned the whole inside of his house, their few pieces of furniture and their belongings, but survived and appears fine. I’m thankful for God’s protection. Recently, during one of my days in the classroom, he came running excitedly into the room, ran up to hug me yelling, “Hola Pamela, Hola Pamela!” As I said before, I had never heard him speak. He is now very social, plays with all the kids, participates in all the class activities and is a completely different child. But God! I feel so blessed to be here and that God is allowing me to minister to theses children and to the teachers. In a short time, God has already allowed me to see results of our work. I thank you so much for doing your part to make this possible. There are so many needs here, big huge seemingly impossible needs. But with God, all things are possible. He is making a way for these children who without some intervention, both educationally and spiritually, would have no hope. Please know that your support of this work in important and I know is precious in the eyes and heart of our Father. I covet your prayers that God’s wisdom and power flow through the work of our hands and our words, that God be magnified and that all the plans of the devil against the people and the nation of Honduras be brought to nothing, that this nation rise up in the power of the Almighty God and that a great revival of the Word and the Spirit be in this nation and all over the world. And that as you have given, may God greatly multiply the seed that you’ve sown and His grace and peace be abounding in you and upon you. Strengthened with all might according to His glorious power! I thought I would share some of the faces of lives we have been able to work directly with this past year. These are children that are from two different schools here and a few that I work with directly from the downstairs part of my home. 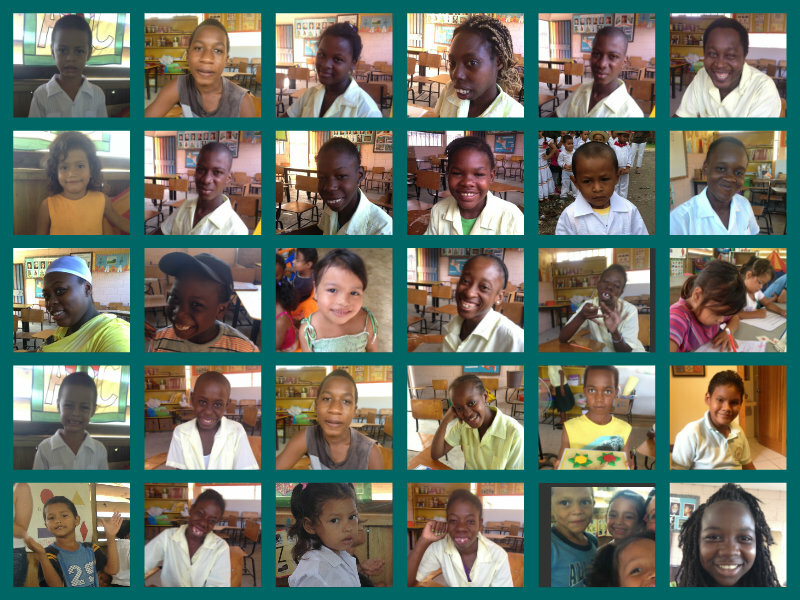 These children are unable to attend a “normal” school due to special needs and/or poverty. Even the public schools require school uniforms which many are not able to afford. Honduras is a country of 8.5 million people with 71 percent of the population living in poverty. God loves these children as powerfully as He loves every child in the United States. We get the privilege of being God’s hands to give them a portion of what we have been given. “Freely you have received, freely give.” Matt10:8 .Several of our students have shown improvements in their abilities and self-confidence. But just as rewarding is to see their joy in learning. I just love what I get to do. I would encourage you that if God is speaking to you about things He wants you to do (which I am sure that He is as He constantly is) then go after those things with all of your heart. It will take you to places and blessings that you never knew where possible. That joy of the Lord in what I do is what keeps me loving being here in the hard times. We are currently in the rainy season and for a rainy season, it has been dryer than usual. However during the week of Thanksgiving it rained and it rained and it rained. Here the city floods rather quickly and these rains bring what are similar to snow days in the States, a day when school is cancelled, it is hard to get around and it is time to stay safe and warm in your house. Yes, it was cold, 70 degrees, which can be very cold with a lot of humidity and when your body system is acclimated to 90. I know you may be doubting, but really it can! So, sometimes those days can be a welcome time to hibernate and get things done at home. However, this week of rain, it was not as easy for me. The house I live in has had a problem with leaks and I am waiting for the landlord to fix them. But with the strong rains and winds many more leaks popped up and there were at least 20 all over. Hearing the drip, drip, drip in the buckets and repeatedly laying down and drying towels was my main activity of my days and into the nights mixed in with moving furniture. The first day I was doing fine, knowing that it would pass. But the the middle of the second day, it didn’t feel fine anymore and I was losing the perspective that it would actually ever pass. Well it did. We are dry now and I enjoy the house once again. But I am praying for resolve of the “rain in the house” problem. I have two exciting things for the near future. 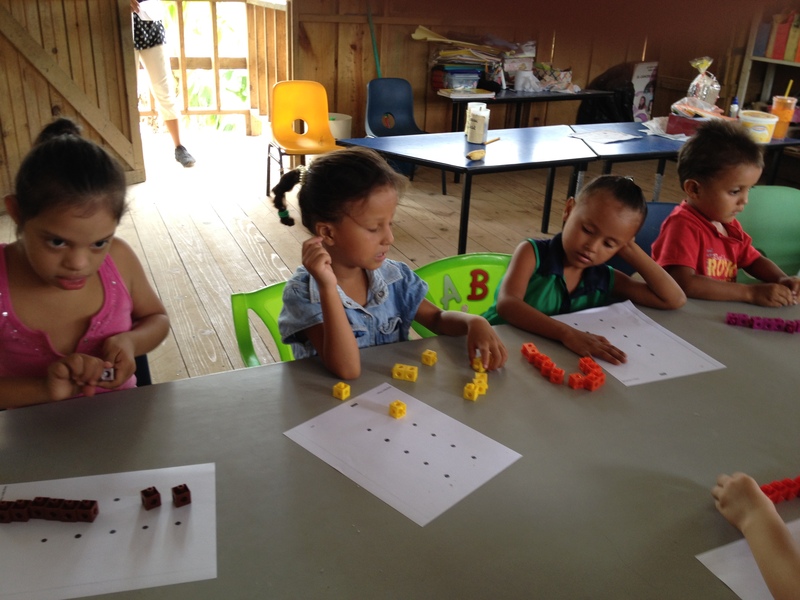 We are planning on beginning classes to develop into a Center for Special Needs in the village of Porvenir. I have been working closely with a teacher there who will be participating. We will be using her classroom in the beginning but will be needing another space before too long. I know that God has the perfect place for us. We are also developing a Children’s Bible Study time that will coordinate with a feeding program in the same village. I am working with the coordinators of the feeding program and a local pastor there. What an opportunity to teach and share God’s love. 2014 is going to be a wonderful year in the things of God! How many towels does it take to catch all the drips? A lot! Greetings to everyone! It’s national election day in Honduras. La Ceiba is the quietest that I have ever seen it. Elections are always held on Sundays here so people can travel to their villages and hometowns to vote. This is an important election for the country as there are some candidates and parties with very opposing views. So, we are pretty much lying low until the day is over and all is settled down. For me it has been a welcome peaceful day in the house to pray, be in God’s Word and get caught up on some things like …… writing a blog post. We are closing down this school year here and have been busy with assessments and using those to plan for next year’s strategies. I’m a planner so I like this part. I would like to thank the precious ones that donated items that I brought back with me in October. I had posted a request in Facebook and several responded with markers, clothespins and matchbook cars. A big Thank you shout out to Pastors Mike and Linda Baskett from Church of the Living Word in Booneville, Indiana for all the egg cartons. This may seems like an odd collection of items, but they are being used to make learning activites for the students that are hands on and fun. First to teach the teachers how to use them. We like fun! And they do too! This past week it was a joy for me to have Gloria Sloan and Rachel Rapha as guests. Gloria is a missionary here in Honduras however she travels all over Central America and is from El Salvador, Mexico and the States. Rachel is from Singapore. She has served in Korea, Africa, Indonesia, Nepal and the Mid-East and it seems that God is now sending her here to la Ceiba. Also in the picture above is Olguita Lainez, the pastor’s wife here and a dear friend. So, we had several cultures coming together and our fellowship was rich as our hearts were immediately joined in our love for serving Jesus. This week as we approach Thanksgiving we are more conscious about a grateful spirit. I have been hearing of the freezing temperatures from home and honestly am very grateful for the 70/84 forecasts here. But a big part of my heart will be with my States Christian family on Thursday. I will be celebrating with several other missionaries about 1 1/2 hours up the mountain. Sometimes you see chicken here instead of turkey, but I am planning on Mary Applegate’s Pumpkin Mousse. My mouth is already watering. If you want some, come on down. Included in the photo collage above is Milagros in her new shoes. I mentioned her in the last blog. She had not been able to go to school since she had no shoes and had a condition with her feet that required a certain kind of shoe. We bought those for her and she is doing wonderfully at school. I love you and am so grateful that you a part of this ministry with me. The children in Honduras here are strong in God’s heart. We get to be His hands and help to them. If not us, then who? Please continue to pray for me here as I travel to other schools and work with the teachers and students. God is opening doors and I desire to walk in those paths prepared ahead by Him and be a vessel for His love and rescue.